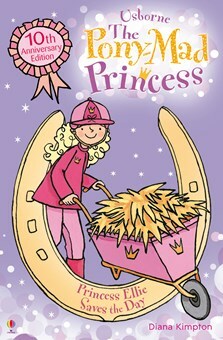 Full of authentic pony facts and sparkly princessy detail! Diana Kimpton is an experienced horse-riding instructor who has written a number of successful books and televisions scripts for children. Meg the palace groom is going on a well-earned holiday and so the old groom George has come out of retirement to help out while she’s away. But George accidentally gives the ponies the wrong food, and when Ellie realises that one of them is ill, she has to act fast to save them. “Make it a hard one,” said Ellie. Meg nodded. “And for an extra mark, what should you do?” she asked. Ellie hesitated. She’d never seen a pony with colic and she hoped she never would. If she did, she knew she’d ask Meg for help, but that obviously wasn’t the answer to the question. “I think I’d call the vet,” she suggested. Kate stared at the pieces carefully. She rolled them between her fingers and held them up to her nose to smell them. “Is it sugar beet?” she asked. “I know, I know,” squealed Ellie. She could hardly resist blurting out the answer. “That’s because you’ve taught us loads of stuff about pony care,” laughed Ellie. “George never did that.” George was the palace groom before Meg and Kate came. He had lots of rules, most of which began “Princesses don’t…” and he never allowed Ellie to help around the stables. “Of course we have,” said Kate. “Gran won’t have my tea ready yet.” Kate’s gran was the palace cook. The yard was still wet from the rain that had sent the three of them scurrying into the tack room earlier. Ellie was glad of her wellington boots as she splashed through the puddles to the tap. She filled a bucket and used it to top up the water container in Sundance’s stable. The chestnut pony nuzzled her shoulder as she worked. Ellie paused and stroked his glossy neck, delighting in the warm smell of horse mingled with the scent of fresh straw. Rainbow looked out of her stable to see what was happening. Ellie ran her fingers through the pony’s grey mane as she peeped over the door to check the water. Rainbow hadn’t touched it yet. The container was still full to the brim. Moonbeam’s wasn’t. It was half empty. Ellie had to fetch another bucket to fill it up. As soon as she’d finished, the palomino pony plunged her creamy coloured nose into the water and blew bubbles. Ellie laughed and Moonbeam shook her head, tossing her snow-white mane in all directions. When Ellie went back outside, she saw Kate coming out of the large stable shared by Starlight and her foal, Angel. The other ponies were all Ellie’s, but Angel wasn’t – she belonged to Kate. “Have you checked Shadow yet?” Ellie asked. “That would be brilliant!” cried Ellie. “I’ll be waiting for you in the yard after school,” Meg promised. But when Ellie and Kate ran down to the stables for their lesson the next day, there was no sign of Meg at all. She had completely disappeared.